Marcella keeping an eye on the storm. We’re so excited about our first blizzard experience. This is the most snow we have ever seen in our kitty lives. We’ve been stuck indoors all day. Okay, we’re always indoors. But sometimes we get to go outside. Unfortunately, the snow is so high, we’d get lost, especially Whitey Mooshie. 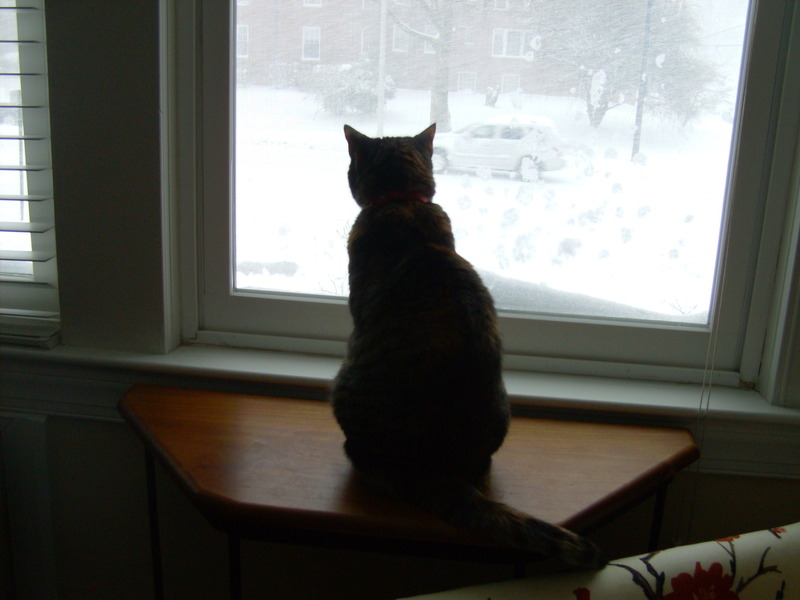 We’ve been watching the snow fall all day and catching the cancellation listings on all the news channels. Mommy went out early to clear off the car and move it to a back street. Then she went to the neighborhood hardware store to buy a shovel but they were out of stock. She came home with a plunger instead. Go figure. Whitey checking on the storm. The snow continued to fall fast and furiously throughout the day. It seemed like it would never stop. Plow trucks couldn’t keep up with all the accumulation. We looked out the window. Slept. Ate. Watched TV. The weather people were very happy. They got more air time than Senator Harry Reid and Tiger Woods. Meteorologists really enjoy measuring snow and discussing historical snow storms. Some TV news channels reported silly names for the storm like “Snowbama”. We felt sorry for all those reporters who spent 12 hours working outside in the cold, standing in front of a mall that closed early. The best part of the storm is that we got to spend the whole day with our mommy. This entry was posted on Sunday, December 20th, 2009 at 4:02 am and is filed under Uncategorized. You can follow any responses to this entry through the RSS 2.0 feed. You can leave a response, or trackback from your own site.